When he?snot commanding a $100 billion space station, NASA astronaut Michael Fincke ischeering on his beloved Pittsburgh Steelers as they head into the NFL playoffsthis weekend. Fincke armedhimself with the Steelers? 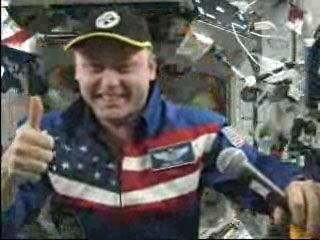 trademark Terrible Towel and a team cap Friday in avideo message beamed to Earth from the International Space Station as it orbited 220 miles (354 km) overhead. ?We?d liketo say though, that up here, it?s Steeler country,? said Fincke with a widesmile and enthusiastic thumbs up. Fincke, anative of Pittsburgh, Pa., who grew up in nearby Emsworth, is commanding thespace station?s three-astronaut Expedition 18 crew, whichtook charge of the orbiting laboratory last October. He is due to return toEarth in early April. ?Duringthat time, we?ve really missed our family, we?ve missed our friends,? Finckesaid. ?But thanks to our friends in Houston, Texas, at the Mission ControlCenter wehaven?t missed out on football, especially the playoffs.? Fincke?sSteelers will face off against the Baltimore Ravens Sunday for the American FootballConference title while the Philadelphia Eagles and Arizona Cardinals vie forthe National Football Conference championship. ?We?d likedto congratulate the four teams that made it to the conference championships,?Fincke said. ?We know that your fans are all rooting for you all across theplanet. ?